Whoa… That is easy. I can’t believe it stores for years just like that. Where do you store it? 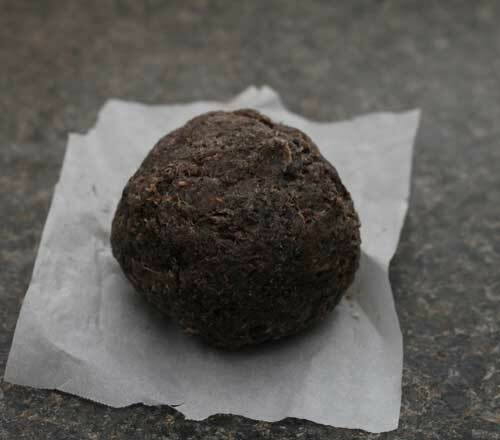 I wrap these “pemmican balls” in wax paper and store them in a ziplock bag in a cool, dark place. It will keep for years like that. Even though they don’t require refridgeration, you can also throw them in a ziplock and refridgerate it. It should store many more years like that. This may sound silly but can u make it into strips for easier packing and eating? That’s the great thing about it. You can mold it into any shape that you want so it is very convenient. I tried a couple of variations of Pemmican. One of which was substituting the ‘animal fat’ with peanut butter. That was tasty and sustaining without the sugar rush of honey. I suppose combinations of all three would work as well. I never thought of peanut butter. I think that would taste pretty good. What keeps the fat from becoming rancid? I think the peanut butter/honey might be great, and the honey acts as a preservative. I do make my own jerky, but in some situations (when water is an issue) the salt can be a problem. I’ll have to try this. Any idea about proportions? It looks like about equal parts by volume of meat/berries and enough of the binder to hold it together. 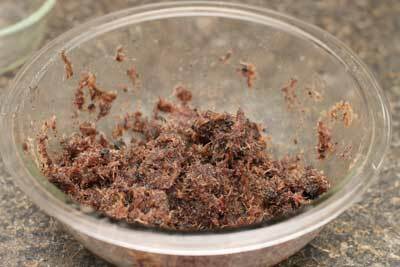 Pemmican avoids all of those through rendering the fat (further removing any unsaturated fats), thoroughly dehydrating the meat, and storing it in a waterproof container. When I moved to Oregon as a little girl, this old indian man made a similar item out of acorn meal,dried berries,pinenuts and deer tallow. The other thing he would make used smoked salmon,dried onions and acorn meal. I don’t know what he used to bind the second recipe with. however the salmon was better. That’s fantastic Jean. I’ll try that since I’m a big fan of using acorn meal in foods. Check out my article on How to Make Acorn Flour if you’re interested in making your own (and already don’t know how). Great questions Anna, I was wondering the exact same things. I would imagine that people could melt palm shortening to use instead of the animal fat if they wanted – it doesn’t add any flavor, but it would give you the healthy fat calories you would need if you were going to be living off of this. Palm shortening would be great since it is a very stable saturated fat as well (in fact they remove much of the unsaturated fats so it remains solid. It’s too bad that coconut oil turns to liquid at around 70 degrees Farenheit. It’s my favorite fat source. I could use it for winter campouts though without issue. Thanks for the comments Maria. Mighty fine information. I’ll have to save this one and try it. I found this article very interesting. I am a vegetarian so I am thinking of ways I could make this veggie friendly. What sort of stuff could one substitute for the meat, ground up? I know TVP is stable. Recently I read in an old backpacker’s book about making meals ahead of time and just dehydrating. Then all you have to do is add water. He suggested meals like lasagna could be made and dried ahead of time. I thought this would be another way for making meals for one’s BOB. So as long as you’re using high quality pure honey (raw is even better), the sugar spike won’t be so bad. I have beef tallow that a friend rendered just WAITING to make this snack. I think it will be perfect for me for the high fat content because I am always hungry and the fat can manage hunger far better than anything else. Could you use ghee or coconut oil instead of animal body fat? Too bad they melt at lower temperatures. You’re right about the honey Ginny, it absorbs into the blood much slower than other forms of sugar. I only buy pure honey. It is a multiple use item and should be part of every prepper’s stockpile. Definitely check in with your experiences. I’d love to hear how it goes! Online sources I’ve read say that homemade jerky lasts about 2-4 months max. I’ve eaten jerky that I’ve personally made that had been stored a little under a year without issue (not to say you should do this as well). I suppose if you vaccuum sealed it using something like a FoodSaver Jar Sealer, and stored it away from light and heat you could get it to store much longer. I also make my own jerky and have had alot of luck using my foodsaver but i use the bags. Make sure your jerky is really dry then put it in the foodsaver bag flat with about half an inch between each piece giving it air chanels. vacume seal on extended seal and store in a dark cool place! I can get 3 years out it that way! Hope it helps! Great to hear some personal experiences. thanks! Could you not use dehydrated vegetables instead of fruit? Sure Cyan, that would not be an issue. What alternatives are there to honey and rendered animal fat. I’m not anti-fat per se however my body does not tolerate it in large amounts since I’ve had my gall bladder removed. With the honey, we have an agreement – I don’t eat it, it doesn’t make me sick. One commenter mentioned he likes it with peanut butter instead of fat (or honey). Could you give that a try? This is a great idea and looks to me than it can be cheaper than the long shelf life food you can buy!! here is a work around for that : highlight everything including pics that you want to save as a pdf , copy /paste to text edit app . , from text edit , you can now print to pdf . thank you TI for sharing this . I’ve been interested in trying my had at pemmican for awhile. I would not be too worried about animal fats in a survival situation, actually much argument has been made that animal fats are GOOD for you and NOT the health culprits they have been labelled as in the past. Anyone who has looked into the ‘paleo’ diet knows that animal fats are considered by many to actually be very healthy and an excellent source of much needed energy. I’m right there with you Janet (being a primal eater myself). Comments suggest the use of fish as a substitute for beef. What about using small game (squirrel or rabbit) or poultry (chicken or turkey)? Also, can oatmeal be added as a filler and fiber source? Yes fish, small game, or poultry is fine. Basically anything you can jerkify (if that’s a word :)) is game (pun intended). It’s a thick, syrupy juice from Agave Cactus. I have a friend who is type 2 diabetic and she uses that as a sweetner because of the low glycemic index. I love Agave Nectar. Just don’t know how long it stores for. If you have not a gallbladder you need enzymes, and keeping fresh raw food like sprouts would help in a time where you do not have the enzymes in stock, Betaine HCI helps because it is the liver that does not tolerate fats. You can always grow sprouts and eat them. You’re absolutely right. Fat is a crucial part of our diet. Proportions?… It’s more about texture than exact amounts. Rancidity was never a problem because it just never hung around long enough. It’s one of those things you just have to experiment with for a more personal touch. In Alaska they dry salmon , but even dried into jerky , its still very oily . I wonder if the use of an oily fish would be adverse to this application or not ? I was wondering if using sausage casing would be a good idea. I read a lot of books about early native Americans and that was what they used. Could you also use dried onions and such? And how would using dried herbs effect the longevity of the product? I am new to the whole idea of survival stuff, but am very interested. Could you give a list of everything you could use to make it with? Thanks so much!! Wow. Genius. Will try this when I get home from Afghanistan. I ended up using peanut butter with the beef and blueberries…it tastes great! I learn so much here and end up doing more research on these topics. Thanks for the great blog & comments. Pemmican would be good to share with my dogs. I like that the recipe is tweakable. 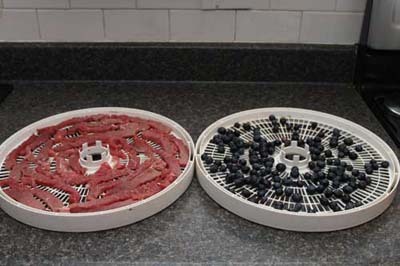 I know the recommendation for drying meat is to bring the internal temp up to 160 before (or after) drying, but for me I’ve been drying meat out in the sun and in my dehydrator (that only reaches 150° F) since college with no ill effects. After all the Native Americans as well as many other primitive tribes have been sun drying for millenia. If it works for them it works for me. If you’re still concerned about safety though, what you can do is dry your THINLY sliced meat at 145° – 155°F for at least 4 hours followed by heating in a preheated 275°F oven for 10 minutes. This will raise the internal temp to 160° F and kill any pathogens. I made some with lean beef, lard from the grocery and my “brilliant” idea of using raisins. My assumption was that they were already pretty much dried. I did put them in the dehydrator with the beef, but they really didn’t seem to change. When I put them in the food processor, they made a huge ball of “nougat”. The mixed ingredients look just like your picture, but i wanted to make strips. I rolled them flat, and used a pizza cutter to slice them AND to pick them up off the cutting board, since they kept falling apart. I thought a few days in the dehydrator might bind them better, but i was wrong. Won’t using Honey and/or Peanut Butter just create a big sticky mess? and about the temperature, why don’t you want the meat to be fully cooked? Thank you for this information and sorry if you’ve already answered these questions. I was also curious as to what temperature to set my food dehydrator to. I always assumed above 140 was good, since milk is pasteurized at 145 and some government regulation (it’s law somewhere ) stipulates that the minimum surface temperature for commercial kitchens is 140 degrees Fahrenheit. I also consume my jerky quickly, so I never really gave long-term storage a thought. So I guess I have two questions: what is the highest temperature meat set out in the sun can reach in the northeast? And two: will dried meat that is not really “cooked” such as sun dried or cold- smoked last longer than cooked meat? I remember an instructor from the Tracker School in NJ saying that pemican should be made from cold-smoke dried meat since this has a longer shelf life. Something about cooking it making it spoil sooner. That instructor is right on. In my experience cooked meat does not last as long as dehydrated “raw” meat. Ultimately, I think it comes down to the moisture content. If you pre-cooked the meat then dehydrated it though, it should last just as long as raw dehydrated. Great recipe. I have seen other recipes before but nothing this “modern”. The local Native Americans made pemican with venison, chokecherries and vension tallow. Would pork lard from the store be a suitable pre-made fat for this.? Is there any thought on what the “stuff” in the fruit does for preservation, some better than others? I used to visit with an older Native American lady years ago and she said her mother made the dried meat. It was sliced very thin and sun dried hanging from pole racks. The meat was sliced from a large cut and not cut all the way through at the bottom and then flipped over 180 degress and sliced again almost all the way through again. It sort of turned out out like an accordian when pulled from the ends. Between the UV rays and heat from the sun and drying all the moisture out of the meat, it was safe to eat. Yeah, I did sun drying all through college without issue. As far as the pork lard (tallow) goes that is fine as well. For those who are worried about getting fat from using fat the human body requires 30% animal fat in its daily diet so it does not store the bad fats in the body. A regular consumption of animal fat found in meats and dairy keeps the body from storing fat to use as a supplement. For another dieting tip. Eating cucumbers in a vinegar and salt broth will fill you up good to eat before large holiday parties empty calories keep you from pigging out. Suppose to have been used by gypsies for hundreds of years So the gypsy girls can stay thin despite the large festivals and feasts they are accustomed to. Thank you for posting this. I am going to use rendered bear fat and venision with cherries for my fist experiment. I really appreciate you posting this recipe. No, no! Please do not use lard from a store! It is almost always hydrogenated, which is the opposite of healthy. Thanks for the post! a nice simple way to make the separate components and put them together. my fave is to add garlic powder, coarse ground pepper, and a pinch of salt to the powdered meat, just before i add the melted fat. yum! Bison was the traditional meat of choice for pemmican used by the Cree and others in Canada (you can still find Bison at some select butcher’s here in Manitoba and some independents). Pemmican should be our national food, as Pemmican allowed for the settlement and development of Canada’s interior (prairies). It’s safe to say many fur traders and settlers would have died from starvation without it. Death At Your Door a weekly webcomic about Death living a life. Thanks for the great info Rod. Can I make pemmican using ground meats (beef, turkey, etc.)? 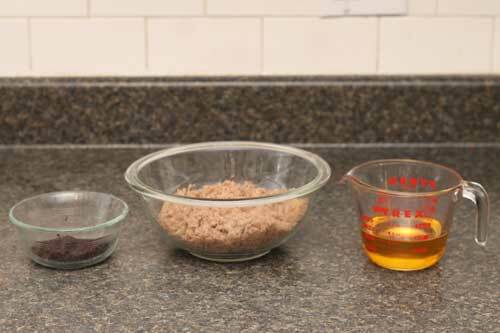 I know that ground beef can be cooked and dehydrated into “rocks” for food storage, but all the fat is rinsed away in this process. Can it be used at all after that? Or should I stick with steak-like meats to dehydrate? For pemmican you don’t want to have any fat on the meat if possible so the lean steak meats are the best. There’s potential that the fat will go rancid during the drying process and can ruin your whole batch. Fat should be added after the meat has been dried. You can dry the meat using a solar oven see http://www.ehow.com/how_2083_make-solar-oven.html . I have made an oven like this and added something. Using the cardboard roller from 2 toilet paper rolls inserted into the lower and upper portion of the oven and makeing regulator flaps over them you can vary the temperature in the oven fairly well. Getting the meat to the 160 degrees is easier this way. Some good info on here, great. Just a quick question please – why not use a FATTIER meat in the first place, e.g. Ribeye, skirt, sirloin etc and then there’s less need for the added tallow surely? Am I correct with this? Sorry if this may be a naive question but answers appreciated. John – The reason not to have fatty meat has to do with the moisture content of the fat on the meat. When you try to dry fatty meat on a dehydrator it doesn’t give up it’s moisture well, and can wind up going rancid from oxidation during storage. That’s why you use fat that’s been “rendered” or cooked long enough to drive all the water out of it, then filtered to remove solids. 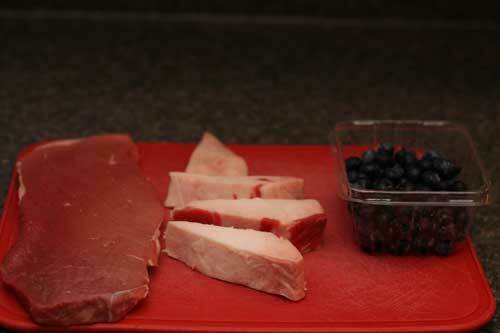 Low moisture meat, fat, and berries (etc) will keep much longer without spoilage. Peter – My understanding about why “cooked” meat spoils faster versus “dried” meat has to do with what happens when meat reaches that “sear” point. Y’know, when that tasty browning action happens on a steak? It’s from some of the proteins chemically combining with sugars… and the more of that high temperature stuff that happens the less other processes that stabilize the meat can continue to exist (positive, fermenting bacteria, like in summer sausage, etc.) Most sites recommend “cooking” meat ‘cuz of our litigious society. Don’t wanna recommend just drying meat the way humans lived on it for millennia. Somebody might get sick, blame you and come after your assets. i got this from Prepper Chicks on FB. Super article! Thanks! Hey, I believe I saw this in the USAF manual, and as you said you were primitive in your younger days, I was curious if you’d used the teepee method of smoking meat. Where you dig the trench with the hole at one end and teepee at the other.. . Thanks for the great article and recipe. I want to make some pemmican, however, my body doesn’t like beef all that much and my nutritionalist suggests I eat more turkey, chicken, and pork. Can I substitute the beef and beef fat called for in your recipe with turkey breast and pork fat and would anything else have to be different for these ingredients to work for pemmican. If I didnt want meat in this recipe what could I substitute the dried meat for? Could you replace the dried beef with beef jerky? PLEASE respond quickly! I dehydrate all kinds of fruits and veggies and vacuum seal them for long term storage. I have some sweet potato powder that I made a couple of years ago. I bet that would taste great in this recipe. As soon as I put it together I will let you know. Great Pat. Look forward to it! Made some this morning after I dehydrated the meat overnight. I partially froze the meat to make it easier to slice. It was a 3lb top round roast. I added 1c crushed dehydrated blueberries, about 1/4c dehydrated butternut squash powder for dry ingredients. 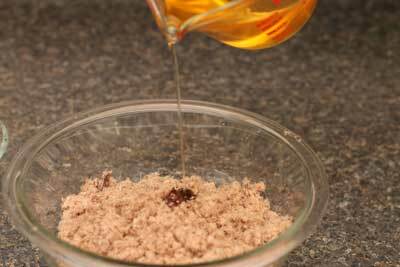 I added 1/2 honey and 1/2 rendered suet for wet ingredients adjusting for texture along the way. It is delish! I shaped it into golfball size balls and put in the freezer. Once hard, I will slice and vacuum seal for storage in small packets. I am thrilled with pemican. I had heard about it long ago but it just came up in conversation at Cabela’s last week so I thought I would look it up. Thanks for posting Pat! I love hearing from everyone’s experiences. Jerky can last for years if you package and store correctly. I vacuum seal and store in plastic bags or jars and increase shelf life to at least twenty five years. I have found if you can vacuum seal all your food stuffs you increase the shelf life by at least 5 to 10 years if not indifinetley. You must keep vacuum sealed food in a dry, dark, cool place.Just last week I was making some gluten free almond bread and realized I did not have any almonds to chop up. I went into my stores and found some almonds that I had vacuumed sealed three years ago. I cut open a bag and the smell of fresh almonds bowled me over. Just like the day I packaged them. Took what I needed and resealed the rest. 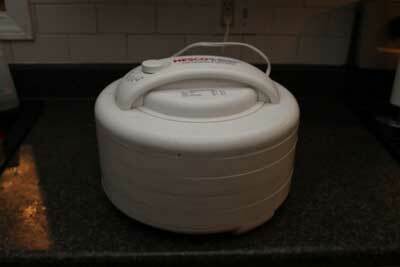 If you do not have a vacuum sealer you are missing out on tons of food storage opportunities. There is a great pemican recipe on this site which will give you meat preserved as long as you need. Just did up some pemican for the first time today and love it. 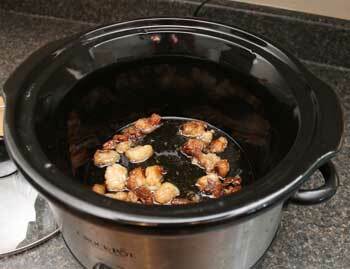 Would adding nuts, such as chopped almonds or sunflower seeds, affect its shelf life? Yes it would lower the shelf life due to the non-rendered fats in the nuts/seeds. In biological systems, many naturally occurring betaines serve as organic osmolytes, substances synthesized or taken up from the environment by cells for protection against osmotic stress, drought, high salinity or high temperature. Intracellular accumulation of betaines, non-perturbing to enzyme function, protein structure and membrane integrity, permits water retention in cells, thus protecting from the effects of dehydration. It is also a methyl donor of increasingly recognised significance in biology.*:’.. Wow! This is amazing! I have been looking for something that I can stuff in a pocket and forget about until its needed, and this sounds perfect! Is there an advantage to using berries rather than vegetables? I read in a book about Tecomseh that the Indians of the old north west(great lakes)liked to use the red berries from sumac trees.very high in vitamin c etc. Sorry, it won’t let me past the link, just google ‘ehow.com’ – how to make nut flour. The Native Americans lived on this stuff for thousands of years before we even dreamed up MRI’s or anything like that. I plan to make some and put it in my hurricane kit for next year. Great idea. I think the sourness of the mixture is part of why it keeps. I’m going to have to look into that further. I’m actually very curious about the reason. Peanutbutter will go rancid. Not a good idea for long term storage. I have been buying beef fat from the butcher in 20 lb batches. I render it in the crock pot and then can it in sterilized quart jars. I use the pressure cooker to can. I have about thirty quarts done. This is something to keep on hand for all cooking. You never know when you won’t be able to buy a bottle of cooking oil. Would make a great barter item as well. Is there a good use for the leftovers solids after rendering other than dog treats? There is this boneheaded Labrador of my family that can’t wait for the next batch! “If you dislike the idea of using animal fat as a binder you can replace it with honey instead. It will keep for a long, long time just as normal pemmican will. OK, I have some cranberries left…. and some TVP…..
and Behold! … Vegetarian Pemmican. I’m a newbie to survival training and meat preservation so apologies for a potentially dumb question, but can someone explain to me the ideal method and heat range to preserve meat at to avoid botulism? Why does cooking the meat and then preserving it increase the risk of botulism? I would have though the incidence of bacteria would be higher in raw meat in something like pemmican? Is it because the spores can survive the cooking process and then multiply without competition from other bacteria? In a survival situation is there anyway to treat botulism poisoning apart from seek medical aid? Cheers for the info- great site! My nieces read a recipe in a novel (Wolf brother by Michelle Paver) where the people make a sort of pemmican using dried salmon, deer fat and juniper berries. They really want to try it but we haven’t gotten to it yet. Garbonzo powder immediately comes to mind, but any dry beans might pulverize well in a food processor. Peanut butter might work but the shelf life is not near as long. The saturated fat and honey are both considered imperishable but peanut butter only lasts a few years, so if you’re looking for a long term stored food I wouldn’t use peanut butter. Has anyone tried freeze dried meat to make pemmican? Everything I read says keep the drying temp below 118 to preserve vital nutrients, which heat diminishes or destroys. Pemmican is not jerky which still has moisture and bends. It uses totally dried meat that breaks and crumbles. See this site by a diabetic who believes it is a super food (http://www.makepemmican.com/pemmican_not_so_secret_recipe.htm). Get a divorce. Marry someone with more than 3 brain cells. I tried making Pemmican for the first time. I used my oven set at 150 with oven door cracked to prevent moisture build up (recipe said). It took about 18 hours to dry out the beef (I used lean beef shoulder) (recipe said 15 hours). I neglected to cut out the little extra fat and membrane (mistake #1) and didn’t cut it thin enough (mistake #2). Result? More rubbery than crispy. Lesson learned. I used fresh blueberries and nowadays they are pretty plump so it took more than 24 hours – first in the oven at about 150 for the first 24 and then with the oven turned off left overnight – to achieve the crispy state. I used lard which is what my recipe suggested. Was my recipe way off the mark? To extend the shelf life. If I were to make it with dried meat, dried fruit, fat and honey. Would the dried fruit cause it to bad sooner? Should I leave it out and only use the meat, fat, honey. Or would the fat/honey preserve the fruit? What’s the expected shelf life for standard pemmican? it’s a little known fact, but the body processes fat as energy more efficiently than sugars. the liver can only metabolize 3 tablespoons of honey a day anyways. the whole natural fat being unhealthy and causing heart disease started back in the 30’s and was prompted by the vegetable oil industry. The key to our amazing brain size is cooking – which is also our bane – the source of our obesity. Cooking food allows us to absorb far more nutrients than a raw food diet. On a raw food diet plan, we could not support the demands of our large brains. The processing of the raw meat into pemmican differs from processing of cooked meat, too. It would be interesting to determine which form of processing is most efficient in preserving nutrients, as well as releasing them to the digestive tract. Great posting! I’m amazed at how long lived it is. Anyway, good information. I’m going to make some soon. This batch is excellent, but next effort ghee will be used for the fat. Also more dried vegetables will be added. Pemmican was made from eye of round beef, Natto soy beans, blueberry, cranberry and suet. The ingredients were dehydrated until very dry, beat into powder in the blender, mixed with the suet, made into one serving balls and set to harden for twelve hours, then vacuum packed in individual packages for storage at room temperature. The ingredients can be almost anything available.Base is the meat, and suet. The mixture has a most pleasant taste and could been enhanced by the addition of various desirable spices. Could you possibly dip this in food grade wax as a storage method. It’d be similar to what is done to cheese. Also how long will this last and is there noticeable markers if the pemmican has turned? I feel the need to point out that berries were exclusively used for pemmican for weddings and ceremonies ONLY. This version you describe was only used/made maybe 1 to 5% of the time (depending on tribe/area). The normal version lasts for decades in dry climate or in rawhide bag. The way pemmican was used was seldom eaten raw(except by those whom prefered it that way!) and instead cooked or prepared when it was needed. So what is the right way to make pemmican that last for decades? How to cook or prepare it before eating? Personally I wouldn’t cook it, I think that’s something mostly Europeans did though i could be wrong. That would denature the enzymes in the meat that were preserved by drying at low temperature. We have a pemmican for sale that is plenty real, though not as strictly authentic as that described by Niji, it won’t last for years but it’s a lot easier to get used to, I think it’s quite tasty, gourmet even: RealPemmican.com We could just as easily make it with only meat and tallow but it would require more meat so it would cost more and the taste might not be so easy to acquire. We’ll certainly consider it if there is enough interest. what about olive oil instead of fat? How would peanut butter powder work. They claim 85% of the fat has been extracted, how would that affect the longevity? HOW DO YOU MAKE IT IN THE OLDER DAYS?!?! I mean, come on! Who has blender in the olden day!? Seriously! TEACH US HOW TO MAKE IT LIKE SURVIVALISTS OR IM NOT COMING BACK!!!! Well, as he said, “in the olden days they’d pound it with a rock”. I have looked at several sites regarding this energy food and this has been the best so far, and the questions that people were asking were also very helpful to me. I have a question concerning the desired amounts. What is the most common amounts of the ingredients used? 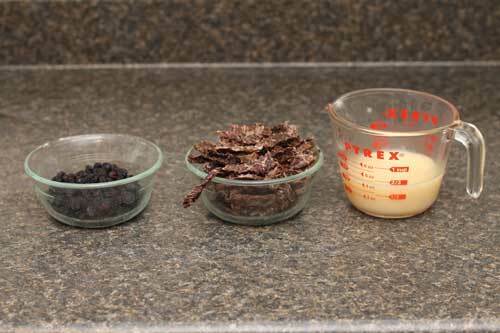 For example: How many cups of lard, blueberries and beef jerky per recipe? I dry my own blueberries and beef jerky but they are vacuum sealed in large quantities so I really wanted an idea before I opened the bags. I welcome everyone’s thoughts and advice. Will it help to store in vacuum seal bags? I am considering packing pemmican into sausage casings. My concern is that you have to soak the casings in water before you use them. Will this moisture speed up spoilage in the meat since the goal is to get all the water out of it before its stored or packaged? I appreciate your help and advice! Due to health reasons, I need to consume foods more on the alkaline scale, than acidic. Chicken, not as acidic as beef is a better alternative for me. Would chicken work well? Everything organic over here, I wonder if organic raw honey (or even manuka honey) combined with coconut oil would be successful. Could store at temp lower than 65*. Also like the idea of onions, garlic, zucchini & green beans, cranberries. Will each of these work well dehydrated? Most of the reading I’ve done says you have to cook poultry before you dehydrate it for safety. I’d look it up thoroughly before using poultry to find the proper technique. I have a question. Would putting an oxygen absorber packet in with a food saver bag extend the shelf life of pemmican. I also have moisture control bags. Would this just be overkill. I am making this to go into my Bugout Bag and I live in Texas where temps can be pretty extreme in Summer. 110°F is not at all uncommon. Should I use less fat or does it really matter? I’m assuming it could possibly turn into a greasy mess in high temps. There are great snacks . Really appreciate the info. Am going off-road and in to the wilderness for the next 4 months, and have been looking for non-perishables for sustenance. This sounds like it will be right up my alley, especially considering the many variations. And hey, variety is the spice of life, right? One thing, though…..could use more ideas for prep methods….your know, like making it a meal as opposed to a trail snack? And am also curious about using powdered peanut butter…..would it work without going rancid? genuinely pleasant and the viewers are actually sharing good thoughts. Ideally, you should equal amounts, by weight, of meat and fat. I do not recommend using berries, as that will shorten the shelf life of the product. Just so you know, if you use meat that was raised on its natural diet, Pemmican provides all of your nutritional requirements. You could live on nothing but Pemmican for years without suffering any nutritional deficiencies. I grew up in the PNW and used to make this when we were younger. An older Salish guy taught us to mix dried mint in it to keep the rodents out. His great grandpa was a trapper and that’s how they mixed up their pemmican, because they’d make a bunch ahead of time and bury it in caches along their traplines before the snow set in so they’d have food available while working during the winter. The mint kept the mice from getting into it. I wonder about peanut butter powder supposedly the oil is removed? I placed all of my oven-dried fruit in the freezer overnight prior to using a food processor. This helped reduce rasins and Craisins.